I write a lot better than I talk. When I want to try and communicate something complex or substantial, I feel most comfortable jotting my ideas down. It happens in school, too: If a class calls for an impromptu important discussion, I find that I can’t keep track of my ideas. I don’t think that what I’m thinking is relevant, and I am incredibly hesitant in contributing to the discussion. Often times I think that most of my thoughts are tangential. The image to the left is dominated by letters from Kate, a girl I could have married. 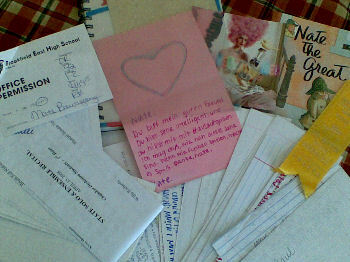 We started to write letters my junior year of high school, and I hope it becomes a lifetime pastime. Originally the letters were cutesy; we’d pretend we were rich folk. In our letters we’d gossip about our rich-folk friends, and how we had plans to attend someone’s house for dinner that coming week. We wrote about our pet penguin, Rufus, who was imported from Africa. There was, in fact, a run of letters that involved me importing animals from all of my business trips. Yeah. I would say our letters are special. If you don’t have a pen pal, whether e-mail or snail mail, I encourage you to find one. Pick me. I am absolutely amorous over getting personal e-mails and letters (check out the three a’s in a row). It’s both a developmental hobby, as well as a fun one. There are other things in the image. There’s a big heart in the middle, but that’s nothing out of the ordinary. It’s Kate’s German valentine to me. It talks about how she says I am so smart, how I help her with her German homework, and how it was fun when she played soccer for my indoor soccer team. Those sound like great things, but since we are terrible at speaking/writing German, we experienced language difficulty, meaning that we had to stretch truth. Here’s the truth: She only said I am smart to act as a filler. I didn’t help her with her German because I never really did. It was not fun when she played soccer for my soccer team. Just kidding, that last one is true from her mouth. She wore these awful silver Pumas, and for that sole reason I stuck her on defense. No, I’m kidding about that too. I did stick her on defense though. The best part of that game was when she was meeting the ball, but missed it when she attempted a pass. I felt bad for her because that’s embarassing for ANYONE to do; at the same time it was extremely hilarious. The second best part was when my leg cramped up at the end, and she walked over to me and told me to stand up and get the guy coming towards us. That’s love. But, like I said, there are other things in the picture. Do you see the woman with the large, pink afro? ((If you write, “. . . pink, large afro. . .” that sounds awkward. Interesting.)) She looks like Alexis Bledel. She totally does. I did some deep googling to find out if the girl was Alexis Bledel, since Alexis did modeling before acting, but I learned that she’s not Alexis. I don’t have the evidence, but you can trust me. It totally looks like Alexis, though. Totally. The eyes and everything. To the left of the heart you will notice an office permission slip. I had my mom telephone in to get this pass for me because I told her to. It was the only time I ever skipped school, and even then, it was only for the last hour of the day. I wanted to see the new Narnia movie very badly, and so I sought out a friend to skip with me. I thought I found one, Simone, but she bailed out. She’s still a doll, though probably a China one. And I don’t mean China like the porcelain China glass dolls. I mean China like the nation. So with no one as excited as I was about the new Narnia movie, I ended up skipping the last hour of school by myself. I went to watch Narnia later that night — alone — and loved it. The kids in front of me, however, were obnoxious. I could not believe that they were there. You will notice a “Nate the Great” book. It’s great — definitely. Probably one of the best Christmas gifts I’ve ever received. Why? Because it’s so witty! Who’d have ever thought of giving me a book about a great detective named the same name as me? Only Johanna, one of the most phenomenal girls I’ve ever known. She’s a real knack for dressing swanky, but not only dressing swanky — she is swanky. In fear that swanky might be defined differently amongst my audience, I define swanky as cool, hip, ill, baller, chic. The book is a thrill, by the way. I won’t ruin the ending for you. The last thing, and you probably didn’t even notice it, is the yellow ribbon. It’s a 4th place ribbon. I feel like I was notorious for placing 4th in my hurdle races in high school. It’s not that I really like the number either. I just happened to be the 4th best hurdler. I wish I still had time to hurdle. It’s awesome to run, but you just transcend running when you have to run with obstacles in your path.